If there are vintage cyclists, I'm geeky. 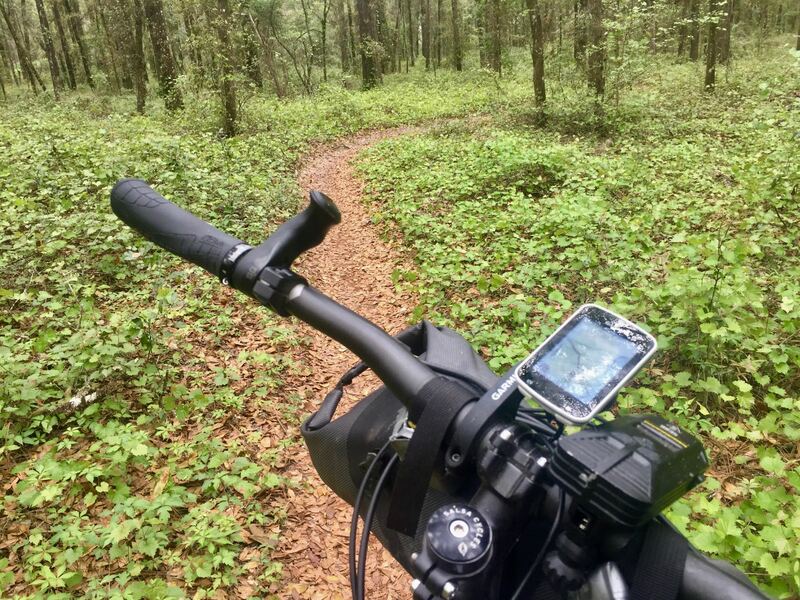 I like my GPS, I even think it contributes greatly to the adventure bike revolution. I also like paper cards, I like to unfold them in front of me, to dive in them, to travel in imagination with them, attracted by their pastel colors, but I gave up using them, that it is during the preparation of my exits or during the exits themselves. Beyond their volume, their weight, their fragility, their cost, their mechanical obsolescence, I discovered that the metaphor of the map as territory had lived. The more I roll, the better I slip into the interstices of the map, into the uniformly colored expanses where it shows nothing and yet we can venture with our increasingly powerful and versatile bikes. The paper map, but also electronic, can not be exhaustive, it can not be the territory. Even satellite images do not succeed (or not yet). In the past, we were confronted with this fact. Around us, we knew the unmapped paths, but our ignorance grew as we moved away. We are done with debt frustration. With my GPS, I'm everywhere at home. Where a cyclist has gone by leaving a trace floating in the cloud, I can go back there with my bike. I am no longer a prisoner of mapped roads and agreed routes, I am no longer a trucker, but an explorer. The road bike has had its moment of glory at the same time as the Michelin maps. The two are confused. When the map is exceeded, the road bike is no more than a practice of nostalgic, yet to adulate the exploits of champions who themselves perpetuate a ritual by habit. Why has Strade Bianche imposed itself in a few years as a major classic? Because it leaves the road, take it back only to reach the land of the Tuscan hills. This race only prefigures those of the future, races that will resemble those of which Albert London speaks in his style which was jubilant because the races were too. The map does not see the path that opens in winter when the vegetation is less dense, she does not see the river bed that can hit in the summer, she does not see the single that friends open for s' to amuse, following the path of boars. The map is indifferent to my practice, it ignores that in gravel I can get off the road, mountain biking I can go almost everywhere, that I can carry my bike, cross streams and climb mountains. The map is the opposite of adventure. By contrast, GPS does not limit us. It allows forbidden convolutions on the map, transforming each of us into an explorer. We do not map. We borrow traces to demonstrate the possibility. We jump from the tarmac to the ground, from grass to pebble. We return the territory to discover the parcels still secret. As much as the roads are numbered, measured, and therefore in limited quantity, the traces are infinite and inexhaustible. They are superimposed, stack, cross and braid. Just play with a site like VTTrack to convince yourself. We zoom in and it's abundant, it swarms, it invites to roll, to add its mark in this imaginary landscape. The trace is a collective creation. To draw one's own implies to superimpose those of others, to trust them rather than just maps or satellite images. Most of the plotting sites did not take this possibility into account. They have not yet adapted the Photoshop logic to cycling. That's why I'm reduced to using Google Map. At the moment, I am planning a mountain bike trip between the Mediterranean and the Atlantic, trying to minimize the roads. For this, I superimposed all traces found that overlap my journey. They draw a blue cloud on the map. So I connect them, I pirate them, I cut them, return them, and little by little, taking advantage of the experience of hundreds of cyclists, I put the outline of an adventure. The organizers of races or raids no longer have to jog the routes, they no longer have to brush the trees with brushstrokes, or the ground with quicklime. The arrows go with the map. He orders to turn right and left. The trace, it is only a possibility, a proposition, which is only for us. The traditional races lock us between barriers, they constrain our imagination, tell us when to drink, to supply us, it transforms us into cattle heading towards the slaughterhouse. The pro race exaggerates this macabre parade. We must go beyond the map and the territory to go to the trace and the territory. Armed with my GPX files, I can leave when I want, with whom I want. I no longer need to register, take a bib, wait for the whistle, to rub me to others to open a path. I'm alone, without a tag, except the dark line on my screen that nothing forbids me to leave if an opening occurs. I could regain the trace with ease, jump on another, change project. The GPS frees me, it reassures me too, offering me the guarantee of not losing me. To take advantage of his power, I must have a bike as versatile as him, as indifferent to the limitations of the card. The GPS allows the bikepacking off the roads, off the marked trails, off the map. It opens gravel and ATV perspectives that no one dreamed of a few years ago. At the same time, it encourages us to collaborate, to share our tracks, to discuss them, to enrich them with points of interest. Our tracks become the scenarios of our cycling adventures. Our GPS, our game masters. As in any role-playing game, the scenario may be licked, nothing happens as expected. Having a GPS track, it's all but having an exit without surprise, already because the GPS often brings us where the map is no longer, where the vacuum opens, not because the map n is not defined enough, but because no map can render the unspeakable terrain. The trace finally has another virtue: it prevents me from letting myself be attracted by the gravity of the roads, their panels, their axes too obvious. The trace, although frozen, paradoxically guarantees my freedom, it keeps me in the nature, far from cars. Without trace, we end up finding themselves face to face with them.